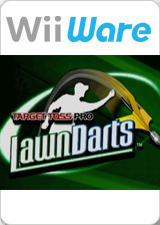 Target Toss Pro: Lawn Darts is a new WiiWare game based on one of the nation's most infamous backyard games. Target Toss Pro: Lawn Darts has four types of flying dart action to choose from: Classic Lawn Darts, 501, Cricket and Poker Darts. Each game has a unique scoring method and strategy to keep you entertained for hours. Classic Lawn Darts involves throwing three darts at two circles with an escalating Red Dot Bonus bull's eye in the center. 501 is similar to the classic pub darts game of the same name, and involves throwing three darts at a dartboard during eight rounds of play until all 501 points—and not one point more—are cleared. Cricket is another classic pub darts game of three tosses per round where players compete to close out the numbers 15 through 20 and the bull's eye before their opponent. Poker Darts involves launching five darts at a deck of 52 playing cards while attempting to get the best poker hand, and highest scores, over three hands. The graph below charts the compatibility with Target Toss Pro: Lawn Darts since Dolphin's 2.0 release, listing revisions only where a compatibility change occurred. This page was last edited on 23 January 2018, at 10:55.